Dalkeith Thistle lost out in a thrilling encounter at Dundonald Bluebell thanks to a controversial late goal. The game started at breakneck speed and the Jags almost took an early lead when Stephen Scott saw he left foot finish saved by the feet of the Bluebell keeper, whilst at the other end Connor Easton had to look smart to thwart Sibanda. Blake Wales was presented with a glorious chance but blazed the ball high over the bar following a cut back from Stephen Scott, while Sibanda again tested Easton on 33 minutes with a low drive which was turned round the post. Straight from the restart Salazar found himself clean through on goal but the ball got stuck under his feet. Dalkeith did have the ball in the back of the net on 70 minutes when Stephen Scott finished following neat interplay between Wales and Salazar, however, the Dalkeith hitman was adjudged to have been offside. 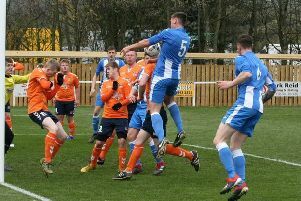 The home side came closer to scoring again on 75 minutes when Wedderburn volleyed over the bar from six yards when it seemed easier to score, however, the goal wasn’t long in coming just a minute later. Lister was clearly pulled back when in possession some 25 yards from goal but Dalkeith switched off and this allowed second half substitute trialist McDonald to curl home a low drive which beat Easton off the inside of his post. Jags lost their discipline with Lister sent off for a second yellow after venting his frustration at the referee and Janczyk followed him soon after for a similar offence. Despite being down to 9 men, the Jags almost salvaged a point deep into injury time when Ryan McQueenie somehow found himself free inside the six yard box only to see his net bound effort superbly blocked by Wedderburn.